A significant study links berry consumption with improved heart health. You can't get the same benefit from a pill or supplement. You won't need a spoonful of sugar to help this medicine go down: eating more blueberries and strawberries may be a tasty way to protect your heart. The finding comes from a new study led by Dr. Eric Rimm, associate professor at the Harvard School of Public Health and Harvard Medical School. "The sooner people start the type of diet that includes a higher intake of blueberries and strawberries, the better," Dr. Rimm says. Dr. Rimm's team gathered data from 93,600 women, who, at ages 25 to 42, signed up for the Nurses' Health Study. Over the course of 18 years, they reported how often they ate various kinds of food. Why look at relatively young women? They're a group at low risk of heart attack. Factors that increase this risk should be easier to tease out in this population than among older people with many heart attack risk factors. And risk factors seen in young women likely apply to older women and men. And a risk factor did turn up: women who ate the fewest blueberries and strawberries were at increased risk of heart attack. Those who ate the most were 34% less likely to have suffered a heart attack than were women who ate the least of these fruits. How much do you have to eat? There wasn't much difference between women who ate just a few berries now and then and those who didn't eat any at all. 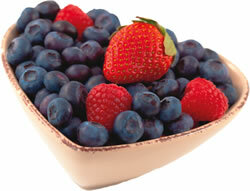 There seems to be a threshold effect—that is, one has to eat a minimum amount of berries to get heart benefits. "The people with heart benefits had three or more servings of a half a cup of blueberries or strawberries each week," Rimm says. The study focused on young and middle-aged women. But the findings likely apply to everyone, including men. "If you do feeding studies where they feed people a specific diet for four weeks, the biology of what happens is similar in a 60- and a 25-year-old," Dr. Rimm says. "So I don't expect the benefit is much different for others." Why just blueberries and strawberries? These berries are particularly rich in chemical compounds called anthocyanins. Research suggests that anthocyanins have several effects on the body. They lower blood pressure, and they make blood vessels more elastic. Don't leave the produce aisle without berries in your shopping cart. Start the day with berries in your yogurt, cereal, oatmeal, or smoothie. Berries are great in green salads. Also consider adding sunflower seeds, walnuts, or garbanzo beans for added protein. Blueberry pie and strawberry shortcake don't count—too much fat and too much sugar. Consume berry-flavored desserts sparingly, and choose a dish of "naked" berries for dessert instead. Anthocyanins are a subset of a group of chemicals called flavonoids. The Rimm study suggests that anthocyanins are particularly heart-healthy—but Dr. Rimm is quick to point out that while his study proposes anthocyanins as dietary good guys, it's not definitive. "It is our underlying hypothesis that these foods are beneficial because they are high in anthocyanins, but whether it's just this or some other substance in the blueberries and strawberries has yet to be proved," he says. You could go out tomorrow and buy anthocyanin supplements. Will they do you any good? "That worries me because I am not sure that is the best way to do it," Dr. Rimm says. "My fear is that taking an anthocyanin pill will not be same as eating three or four servings of blueberries. Given that you can get adequate amounts from eating a diet high in berries, I don't see why you should take a pill. Stick to the food." 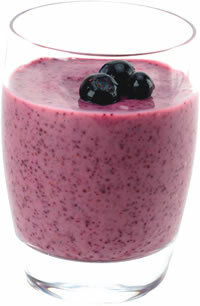 INGREDIENTS:?1 cup plain, nonfat Greek yogurt, cup orange juice banana, cut into pieces, cup blueberries, fresh or frozen, cup ice. NUTRITION FACTS: Servings: 1. Serving size: 12 ounces. Calories 310. Protein (g) 21.7, Carbohydrate (g) 56.5, Fiber (g) 3.4, Fat (g) 0.6, Saturated fat (g) 0.1, Trans fat (g) 0, Cholesterol (mg) 0, Sodium (mg) 87. Source: Recipe from Harvard Special Health Report The Harvard Medical School 6-Week Plan for Healthy Eating. Published: Jan 2013. Harvard Health Publishing.